Who argues the most from authority? If the intellectual merit of a body of ideas is not so well established, you're more likely to deflect attention by reassuring everyone that, hey, it can't be that crazy -- after all, the guy is a Nobel laureate. Perhaps that's why physics ranks above chemistry here, what with string theory etc. taking it further into speculation compared to more grounded chemistry. To test how sensitive Google Trends is to fundamental changes in the thing you're asking about, I decided to see if it could pick up the seasonality of fruit availability. Sure enough, it does. Just check blueberries or pomegranate: when the fruits are plentiful, people are very interested in them; outside the peak season, interest plummets. Interestingly, you see something very similar for how much people are searching Google for intellectual topics, which is an indicator of how long their interest lasts. I noticed a funny cyclical pattern awhile back when I searched Google Trends for slavery. I had a hunch but filed it away. Now I've looked into it, and it's what I thought -- it tracks the school year, specifically when mid-term and final papers are due during the fall and spring semesters. There's sharp drop during Christmas vacation, and a steady low level during summer vacation. To show that this is true, you see the same pattern for postmodernism, Freud, Foucault, semiotics -- plus Darwin, evolutionary psychology, differential equations, and linear algebra. That shows how long the average student, after exposure to some body of thought, retains interest in it over their lifetime -- about a day or so after the exam is done. And intellectual merit hardly seems to matter -- real stuff like differential equations doesn't seem any stickier than the snake oil of postmodernism. If you're an educator who's ever suffered from the delusion that you can inspire lasting interest in your subject, these graphs should wake you up. Sure, there's that one student whose eagerness for the subject is just a bit creepy (unless she's a cute girl, of course), but most of your students will treat your class like they do the movies they see in the theater -- or the Malcolm Gladwell books their parents read -- which provide brief fun but are forgotten a week or so later. This more or less contradicts the proponents of higher ed for everyone, of a core curriculum, and of similar policies that are based on the assumption that students retain anything at all. After their Harvard undergrad educations, most alumni had no clue what causes the seasonal change in weather. (They tend to say that it's due to the elliptical orbit of Earth around the Sun -- summer when it's closest and winter when it's farthest away.) If they're just going to flush out the course's content once the semester is over, why make them take the course in the first place? Except for the school to get their money, and for the professor to keep his job through high enrollment. "But higher ed is not just pre-professional training -- it's about cultivating the garden of their mind!" Well, if the average student were at all intellectually curious, maybe. But most aren't -- once their final paper is in, flusssshhh! To revisit the topic of the education bubble, most arts and humanities majors could cruise through undergrad in two years tops, unless they were dead set on becoming academics, in which case they'd really need to absorb a lot more information. But if you're majoring in history or English in order to go to law school, who cares if you only surveyed one period of English poetry, rather than from Beowulf to the Beats? Obvious exceptions are technical or professional majors, such as engineers needing to know calculus, statistics, etc., which might take them three years to complete. The cold hard reality, shown by the Google Trends data above, is that just about all students are going to junk everything they ever learned in college once they're done with the course -- not even once they graduate. Therefore, having them schlump around all day in these throwaway courses only wastes their time, money, and energy, which could be spent producing stuff. Aside from signaling that they haven't gone braindead or really fucked up their work ethic after high school, a college degree doesn't mean much, unless it's a technical one. So, give them a year or two to prove this, and then get them out into the real world. They'll probably come out the other end of college with healthier livers to boot. P-values come from null hypothesis testing, where you test how likely your observed data (and more extreme data) are under the assumption that the null hypothesis is true. As such, they do not allow us to decide which of a variety of hypotheses or models is true. The probability they encode refers to the observed data under an assumption -- it does not refer to the hypotheses on the table. Using information criteria allows us to decide between a variety of hypotheses or models about how the world works. They formalize Occam's Razor by rewarding models that show a good fit to the observed data, while penalizing models that have lots of parameters to estimate (i.e., those that are more complex). Whichever one best balances this trade-off wins. Although I'm not a stats guy -- I'm much more at home cooking up models -- I've been told that the broader academic world is becoming increasingly hip to the idea of using information criteria, rather than insist on null hypothesis testing and reporting of p-values. So, let's see what JSTOR has to say. 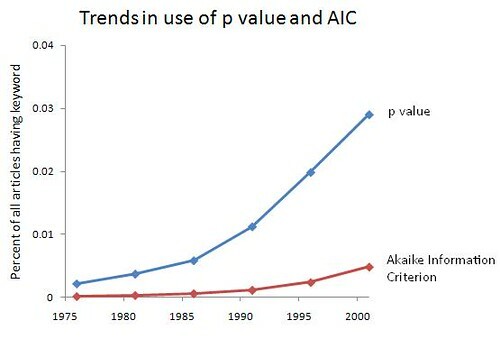 I did an advanced search of all articles for "p value" and for "Akaike Information Criterion" (the most popular one), looking at 5-year intervals just to save me some time and to smooth out the year-to-year variation. I start when the AIC is first mentioned. For the prevalence of each, I end in 2003, since there's typically a 5-year lag before articles end up in JSTOR, and estimating the prevalence requires a good guess about the population size. For the ratio of the size of one group to the other, I go up through 2008, since this ratio does not depend an accurate estimate of the total number of articles. From 2004 to 2008, there are 4132 articles with "p value" and 927 with "Akaike Infomration Criterion," so the estimate of the ratio isn't going to be bad even with fewer articles available during this time. It's promising that both are increasing over the past 30-odd years, since that means more people are bothering to be quantitative. Still, less than 5% of articles mention p-values or information criteria -- some of that is due to the presence of arts and humanities journals, but there's still a big slice of the hard and soft sciences that needs to be converted. 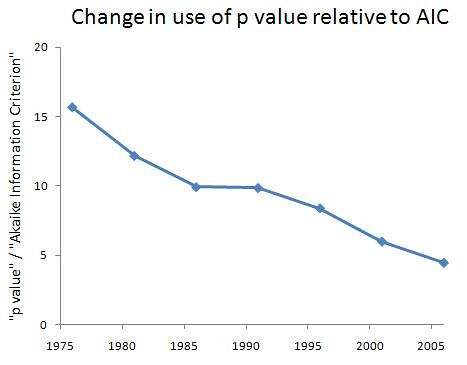 Also encouraging is the steady decline in the dominance of p-values to the AIC: they're still about 4.5 times as commonly used in academia at large, but that's down from about 15.5 times as common in the mid-1970s, a 71% decline. Graduate students and young professors -- the writing is on the wall. Aside from being intellectually superior, information criteria will give you a competitive edge in the job market, at least in the near future. After that, they will be required. What needs to change in academia?